The budgerigar (Melopsittacus undulatus) /ˈbʌdʒərɨ����r/, also known as common pet parakeet or shell parakeet and informally nicknamed the budgie, is a small, long-tailed, seed-eating parrot. Budgerigars are the only species in the Australian genus Melopsittacus, and are found wild throughout the drier parts of Australia where the species has survived harsh inland conditions for the last five million years. 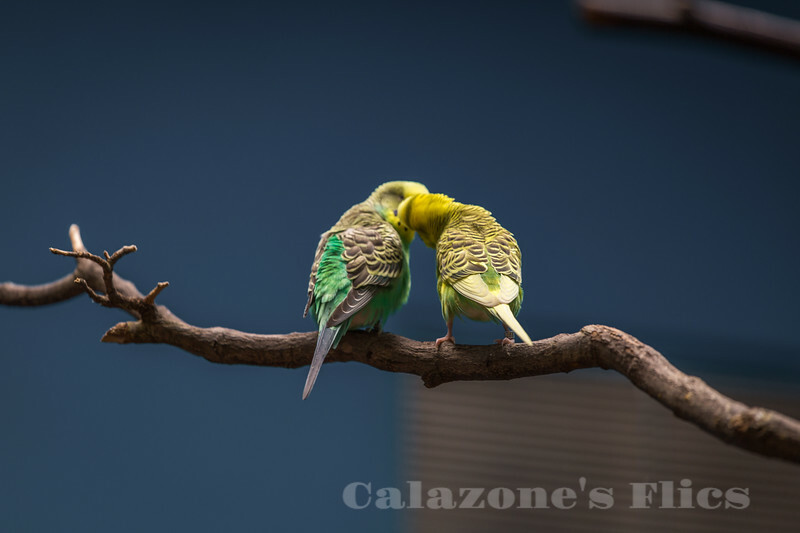 Budgerigars are naturally green and yellow with black, scalloped markings on the nape, back, and wings, but have been bred in captivity with colouring in blues, whites, yellows, greys, and even with small crests. Budgerigars are popular pets around the world due to their small size, low cost, and ability to mimic human speech. The origin of the budgerigar's name is unclear. The species was first recorded in 1805, and today is the third most popular pet in the world, after the domesticated dog and cat. The budgerigar is closely related to the lories and the fig parrots.They are one of the parakeet species, a non-taxonomical term that refers to any of a number of small parrots with long, flat and tapered tails. In both captivity and the wild, budgerigars breed opportunistically and in pairs.